By the way, this is a post about my Windows days – this is much easier to do in Linux – but thats another story. This is a fairly advanced hack – its not for everyone. It involves editing core Windows files – which might be dangerous if done incorrectly. It also involves a bit of reverse engineering which might be considered illegal by some lawyers. So continue only if you are sure. This hack involes modifying Windows core files – which might some problems if done incorrectly. I cannot be held accountable for the outcome – be it good or bad. Actually, scratch that. Ff the result was a success, feel free to hold me accountable. If you decide to continue, I would say that the result is worth the risk – you will learn a method that will let you add custom shortcuts to application that don’t provide you with the source code. And it gives you a really cool feeling if you actually manage to pull the hack successfully. I originally made this hack for Windows 98 – but it works on Windows XP as well. I have not tested it in Vista – I would be very grateful if anyone lets me know if it works in Vista or not. Get Resource Hacker – you will be editing core windows DLLs with this tool. FreeDOS or Linux Live CD/DVD – you have to save the file to the original location when windows is not running. You must also know how to work in the Live OS – be it DOS or Linux. Courage – As I said before, this hack is not for the faint of heart. Make a backup of ‘C:\WINDOWS\system32\browselc.dll‘ and ‘C:\WINDOWS\system32\Restore\filelist.xml‘ before doing anything – just in case. 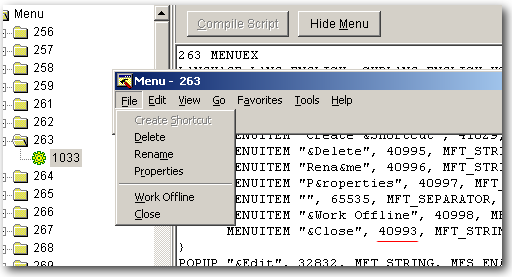 In the ‘Menu’ find look through all sections to find a menu with the ‘File->Close’ item. In this the number 40993 is what we want. Write the number down somewhere. Think of it as the function that gets executed when that menu item is clicked. You can create a shortcut for any menu item by find out this number for that menu item. Now we have to add a shortcut for this ‘function’ – go to the ‘Accelerators’ section – ‘Accelerators -> 256 -> 1033’. We found the menu at Menu -> 263 -> 1033 – so the Shortcut should be at Accelerators -> 256 -> 1033. See the pattern? I have changed the number to 40993 – the call for the ‘Close’ action. Now hit the ‘Compile Script’ button on the top. If you have done it correctly, you should not get any errors. Congratulations, you have successfully created a new ‘Accelerator'(shortcut). Now the hard part – putting the file back into ‘C:\WINDOWS\system32’. After doing this you may not be able to save the file. Curse windows for a bit and continue. Now you will be able to save this file – do so. The next thing to do is replace the original browselc.dll file with our hacked version. This cannot be done when windows is running. It must be done when windows is down – that’s where FreeDOS CD or Linux Live CDs comes in. Now remove the FreeDOS CD, reboot back into windows. If you have a live Linux CD, pop it in and boot into that. Now mount the partition that’s the C partition in windows(usually sda1 or hda1). Then all you have to do is copy the modified DLL file from the ‘Hacks’ folder to ‘Windows\system32\’ folder in that partition using the File manager for that distribution. Once that is done, you reboot into windows. Finally, its all over. All you have to do is open up a folder – and press the Escape key. If all went well, the explorer application will be closed. This is a rather complicated way to do a rather simple thing – you set custom shortcuts easily using tools like AutoHotKey and setting up macros. But by doing it my way, you will learn a method to peek into exe and dll files. And if you are a programmer like me – it will give you hours of entertainment. I have actually found left over stuff from Windows 3.1 in Windows XP DLLs – but that’s a post for another time. I felt from the start that I could care less about closing a window with ‘Esc’ but kept reading anyway because this is so well written. Yet at one point I realised that my whole thinking had been wrong – this isn’t about closing a window with ‘Esc’ at all! “Hours of entertainment”: These 3 words are the key. Only lesser minds will care about something being useful. It’s immeasurably better to be entertained in the process of understanding! Yet another excellent tip – Thanks Binny! Think you just gave me the will i needed to windows to a nEodows operationg system. Too much effort. You don’t need anything like Linux livecd to replace a file locked by explorer.exe. Just run Resource Hacker when you have killed explorer.exe or had it shut down itself (goto Shutdown computer dialog box and while holding Ctrl+Shift+Alt click Cancel and explorer.exe closes itself gracefully). Then carry on with the relevant stuff in Resource Hacker as described above.